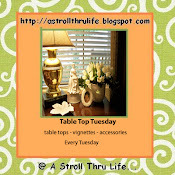 Today I am posting a combination new fall mantel together with my weekly Tea Time teacup post. I have burgundies in my living room and fall fruit is a great match for the mantel. My living room is decorated in my version of English country style. If you want to see my living room reveal, click here. 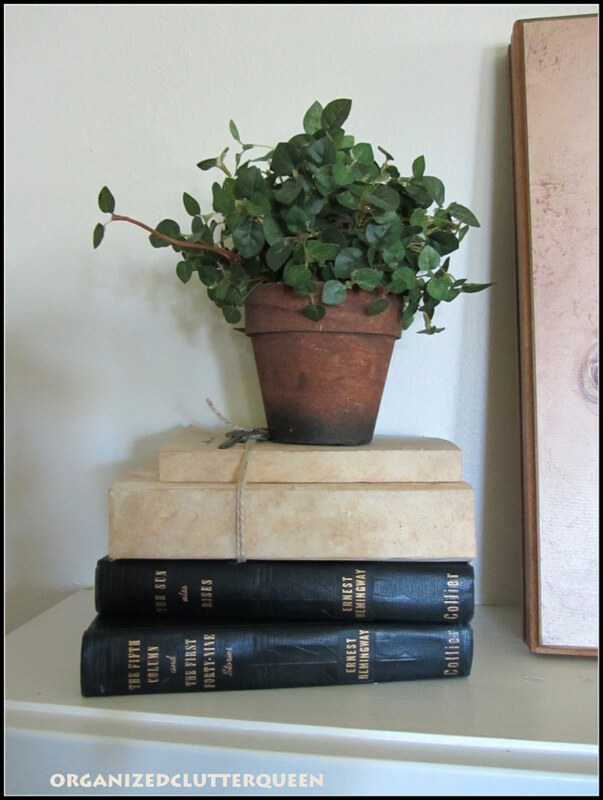 Navy blue Collier - Ernest Hemingway novels, coverless distressed books, old keys, and a faux plant. 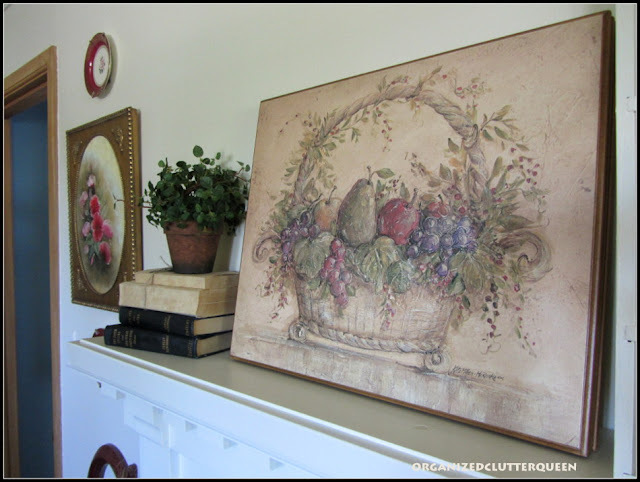 Next, "Harvest Fruit I" Kate McRostie (I purchased this at a consignment shop, but it is originally from Target). 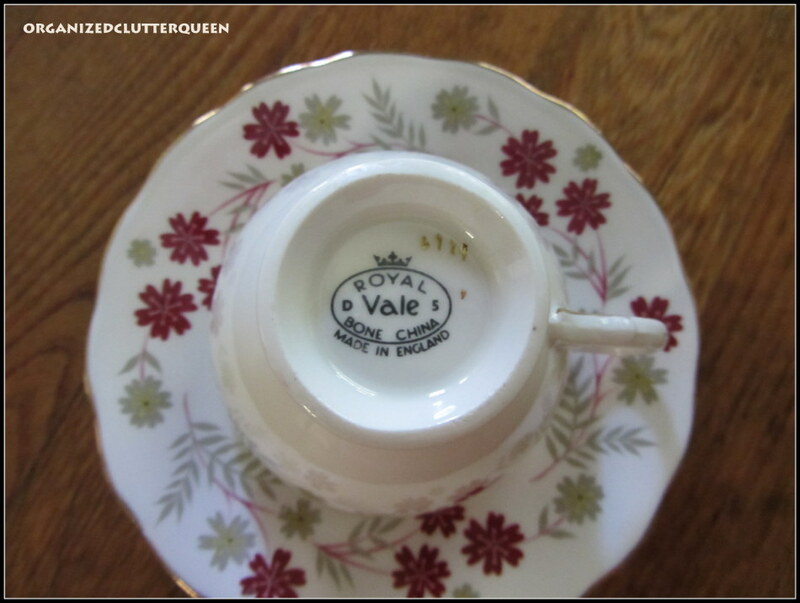 Next pears, a Royal Vale teacup and saucer, a "made in Japan" lady head vase, two cups and saucers that were my Grandma's, (unmarked), and the vintage Franklin Dixon - Hardy Boys books found at a consignment shop last week. Next a vintage wood easel that was gold and I painted white with a consignment shop fall plate (not vintage) and a vintage poetry book, more Ernest Hemingway novels and a made in Japan lady figurine. I loved how the fruit is three dimensional on the top of the plate. 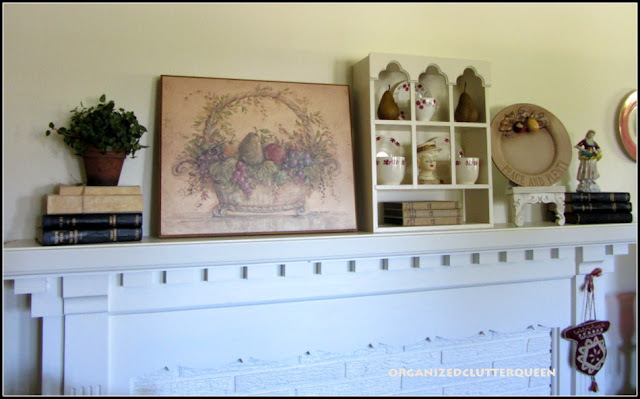 Joining Censational Girl for Autumn Mantels. So pretty Carlene! I love the use of books! The teacups are precious. It all looks so nice together! I especially like the painting. The colors and theme are perfect for fall. I love the shelf! 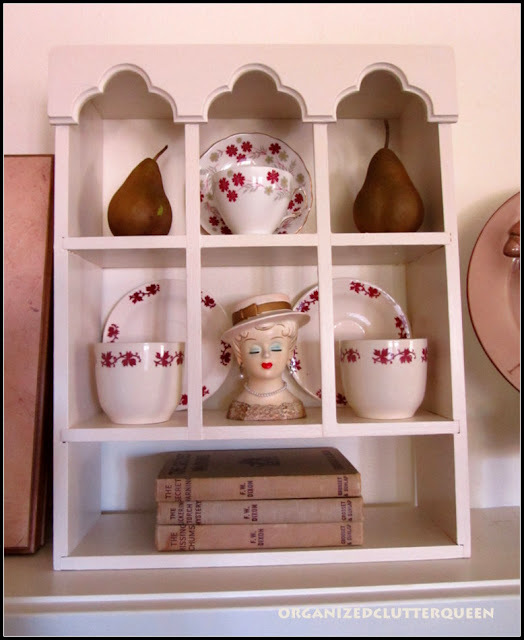 It reminds me a a smaller version of the tea cup shelf in my guest room that I want to paint white. after seeing yours, I surely will be painting it white!! 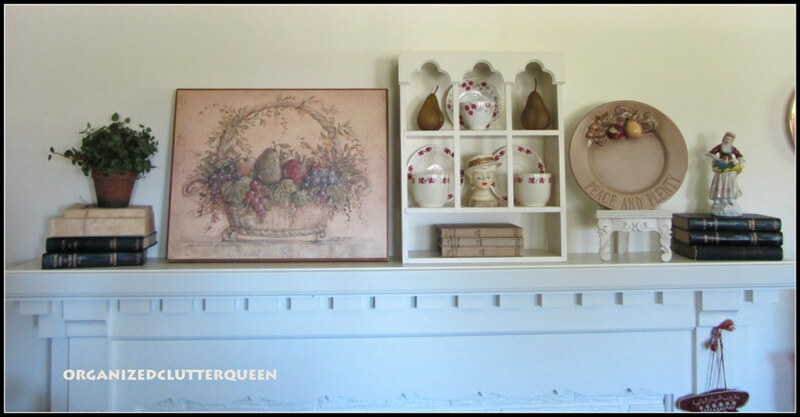 I just recently did my mantel and played with some layering. I like the look! I'll have to check out your post of the finished room. Your mantel looks so beautiful! I love the little teacup shelf, Carlene. Wish you could come over and work on my mantel! 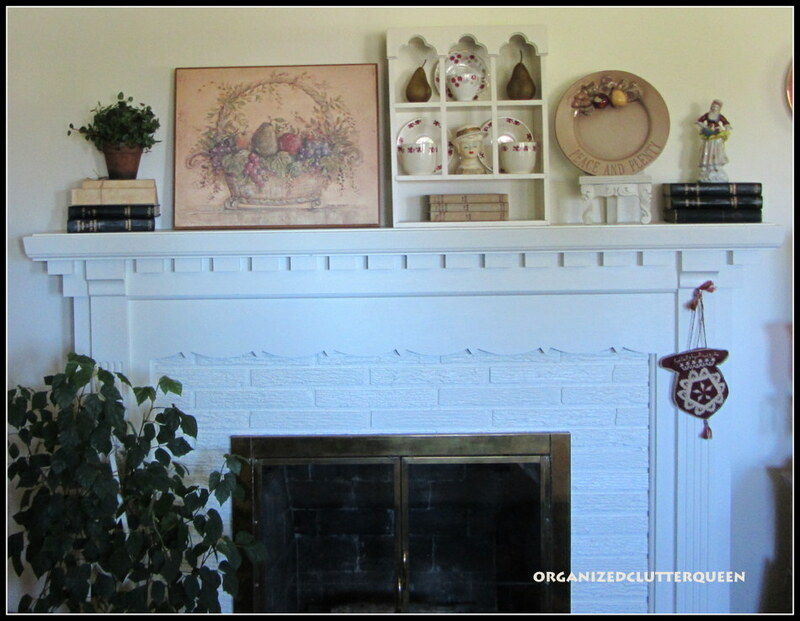 Love your mantel and fireplace, Carlene! Beautifully decorated too. The little shelf is adorable and the teacups are lovely! I always enjoy seeing books used in a display. Thanks so much for sharing and coming to tea. I love your new fall mantel. Gosh how do you do it, got your fall up already, ugh! I feel like I am always behind. I love the little wood easel, and looks perfect white. 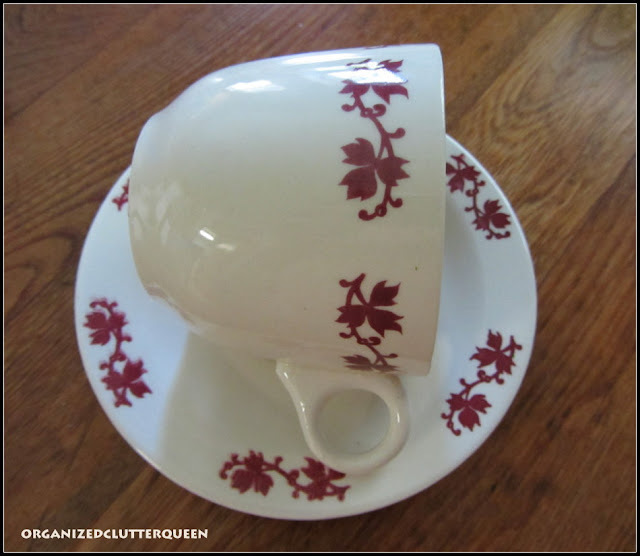 The pattern on the tea cup is so pretty, You did good girl, as always! Thanks for sharing your creative inspiration with Sunday’s Best – you helped make the party a success! Hello Carlene! Your newly dressed mantle looks lovely! I too have old books on my mantel along with a tea cup and other items. The painting is really special too. 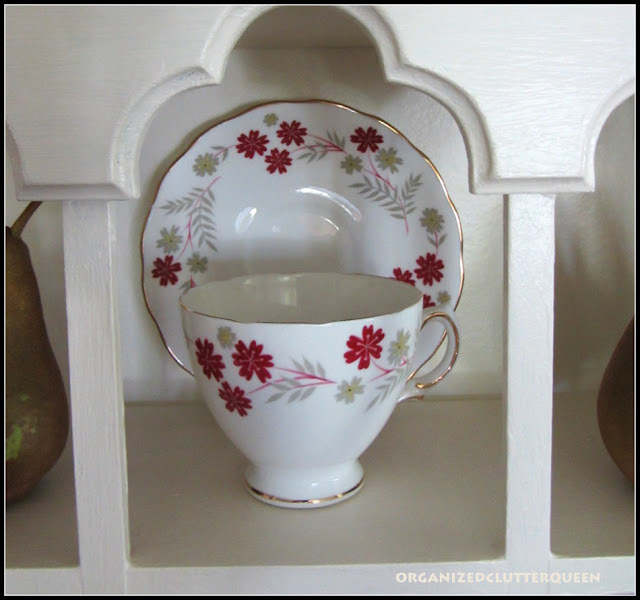 Your tea cups look great on the shelf. That is a pretty Vale pattern. They all look great above your fireplace. Love your mantel! I need to get busy, what an inspiration you are. 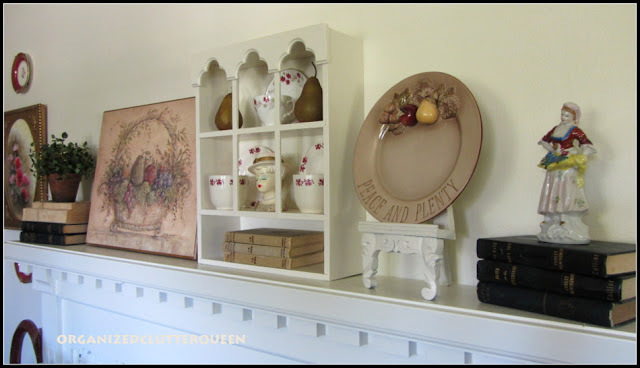 What a beautiful decorated mantel! It really transitions you into fall without being at all over the top.....that harvest fruit painting is gorgeous, I love it! You definitely made good choices in your mantel. Love the arrangement...the red trimmed cups are great here...with the woman head...nice. 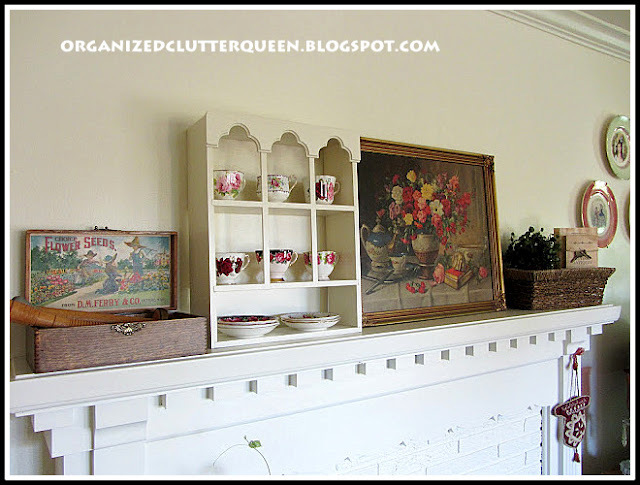 Your new mantel decor is lovely and so are your teacups. How wonderful to have some that belonged to your Grandma. 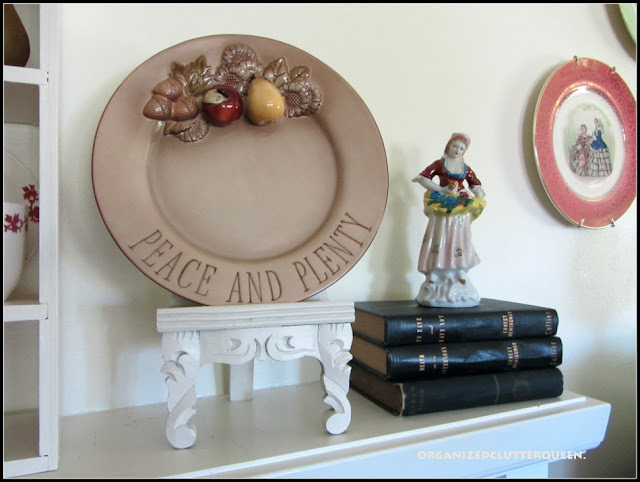 Charlene, I just love the way you carried your fruit theme from one end of the mantle to the other! Very very pretty!!! 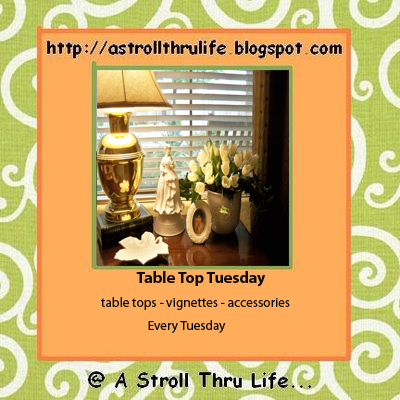 Thank you so much for joining TUTORIALS TIPS AND TIDBITS with your pretty fall mantle! 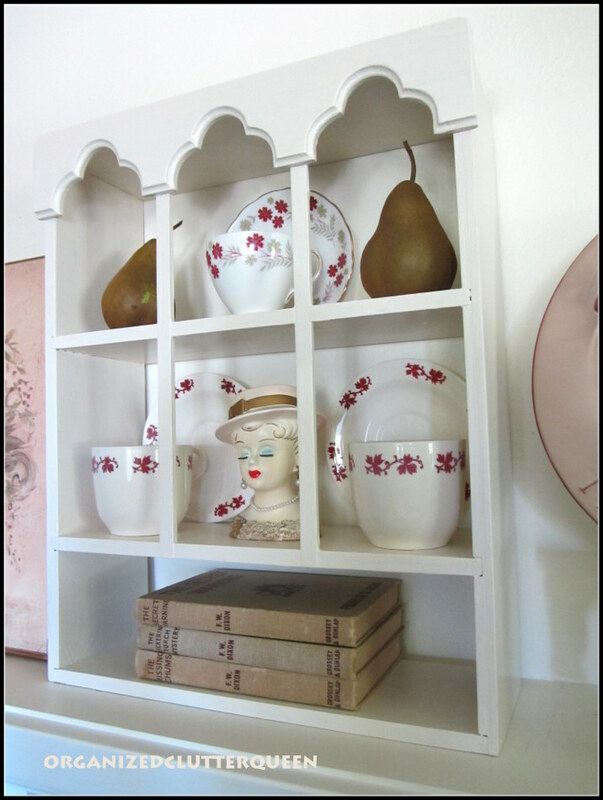 Love the shelf with the pears and tea cups!